With the increasing number of back pain patients around the world, there is a lot of pressure on the medical experts to find out more updated treatment methods to curb this issue. There are many reasons behind Acute Back Pain like injuries, acquired conditions like Scoliosis, infections and tumors, mechanical problems affecting the spine like inter vertebral disc degeneration and many more such causes. Some of the symptoms that the patients many come across sharp and persistent pain, stiffness, pain that pass from back to buttock, legs till toes, pain after sitting or standing for long periods, etc. The Indian hospitals are massively blessed in the matter of medical professionals. The excellence and pool of talent that is present at the Indian hospitals for Acute Back Pain is of the finest kind and at par with the best hospitals across the globe. There are several doctors and surgeons, who are highly knowledgeable and have extensive experience in the treatment of Acute Back Pain. These back pain specialists have cured numerous patients by implementing the latest techniques. · Spinal Injections: There are injections like Cervical, Transforaminal, Thoracic and Lumbar Interlaminar Epidural Injections that are given at the opening at the side of the Spine, near the nerve root. These injections reduce the swelling and inflammation of the Spinal nerve roots and the surrounding tissues. · Spinal Cord Stimulation: In this surgery, mild electrical signals are sent to the spinal cord or to exact nerves to stop the pain signals from reaching the brain. · Radiofrequency Ablation: In this process, electrical signal from a radio wave is implemented to heat up the area of the nerve tissue, thus lowering the pain signals. · Ozone Discectomy (Ozonucleolysis): This is quite new option which is an injection of Ozone-Oxygen mixture administered into the disc. · Surgery: This option is only recommended when the other non-surgical methods have failed to provide any relief to the patients. How can I get Low Cost Treatment Benefits? With Dheeraj Bojwani Consultants, it is not so difficult to avail the extremely low Cost Acute Back Pain treatment in India. Cost effectiveness is one of the key reasons why medical tourism to India is so very popular. Patients from every corner of the world come here, most essentially patients coming from the developing countries find availing treatment in India very feasible for their pockets. 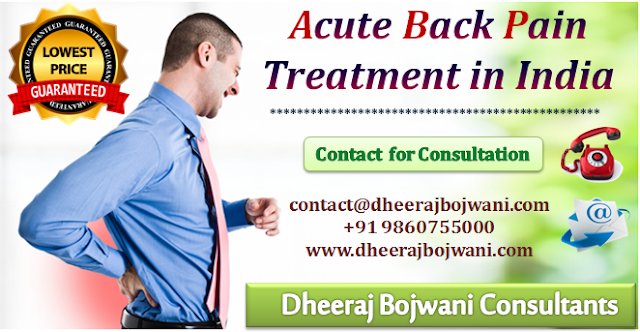 We, at Dheeraj Bojwani Consultants make sure that these patients can access these treatment packages easily.